My children love the zoo. Whether it is the lion or elephant, we have to visit each animal during every trip. My kids saw a game about the zoo, they jumped at the chance to play it. Zoo Panic is a game of strategy for kids of all ages. The premise of the game is that the escaped animals need to be returned to their cages. With no reading involved to play the game, Zoo Panic is a fun game for kids of all ages. Players move around the board bringing animals back to their cages. Players earn trophies for bringing animals back to the correct cage. The person with the most trophies wins. What we like about Zoo Panic is that the game develops critical thinking. The kids may not realize the underlying concept, but they are learning that one path has better results than another. It is a game that can grow with the kids as they better understand game strategy. I was a little concerned that my kids might think this game was a little young for them. But they loved it. It is a great game that they can play on their own, especially since there is no reading involved. 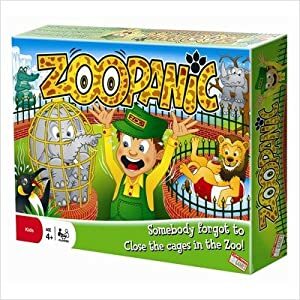 Zoo Panic can be purchased at Amazon.com for around $25.00. It was named Danish game of the year in 2009. Zoo Panic is distributed by Endless Games. Get your kids in love with games this holiday season. Add Zoo Panic to your holiday gift list. It's a game for the whole family. Disclosure: I received a copy of Zoo Panic to facilitate this review. All opinions are 100% mine and were not influenced by any person or entity. For my complete disclosure policy, please visit www.more4momsbuck.com/disclosure.